In 1977, The Haplochromis Ecology Survey Team (HEST) of Leiden University, the Netherlands in cooperation with the Tanzania Fisheries Research Institute (TAFIRI), started to study the cichlid communities in the Mwanza Gulf and its vicinity (cited from Witte et al., 2007). Many new species were discovered, including a large group of zooplanktivores, and by 1985 the total number of cichlid species in the lake was estimated at more than 300 (Witte et al., 1992). 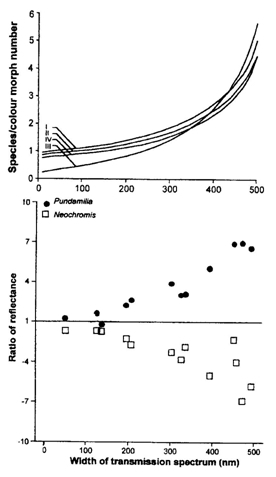 In the sub-littoral and offshore waters of the Mwanza Gulf, species feeding on detritus, together with species feeding on zooplankton, dominated the haplochromine ichthyomass (Witte, 1981; Goldschmidt et al., 1993). Surveys made in the Kenyan and Ugandan parts of the lake between 1989 and 1992, revealed approximately 30 new species (Kaufman & Ochumba, 1993). Finally, sampling along rocky shores and islands in the south-eastern parts of Lake Victoria, in the first half of the 1990s, produced some 100 previously unknown species of strictly rock welling cichlids (Seehausen, 1996; Seehausen et al., 1998). Currently, it is estimated that more than 500 cichlid species formerly (directly before the Nile perch upsurge) lived in Lake Victoria. 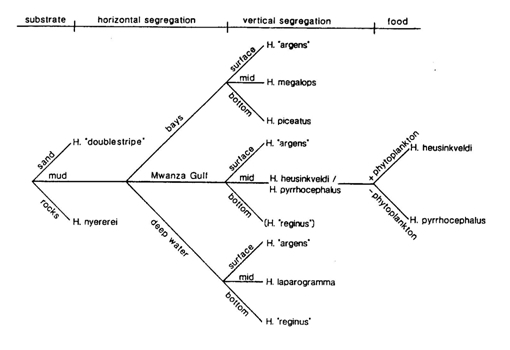 This flock of more than 500 endemic haplochromines was monophyletic and showed an extreme adaptive radiation. Virtually all habitats and food types were exploited by these cichlids. They comprised, for example, species feeding on phytoplankton, prawns, other fish, algae from substrates, snails and shells, insects, zooplankton and more peculiar resources such as cichlid eggs and larvae that are stolen from the mouth of brooding females. Though similar feeding habits and life styles occur in Lakes Malawi and Tanganyika, the morphological radiation in these lakes is more extreme, especially in Lake Tanganyika. In spite of the difference in the range of morphological radiation, species with similar feeding habits show similar adaptations in the three lakes. For instance, in each lake there are species picking insects from the substrate with forceps like teeth, species with lobed lips, etc. Many more of such examples can be given and could indicate polyphyletic species flock with each of several lineages having a geographic distribution that extends beyond the boundaries of a single lake (Greenwood, 1983). 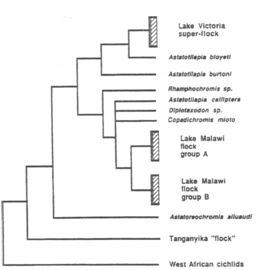 However, DNA sequencing revealed that the flocks of Lake Malawi and Victoria are monophyletic in origin (Meyer, 1993). It is remarkable that the extreme radiation in Lake Victoria was achieved in the geologically short time span of less than a million years and possibly even less than 15.000 years. This can only be partly explained by allopatric speciation: during the process of drying and refilling, populations may have become isolated and genetic drift and adaptations to local conditions may have resulted in speciation. A famous example is provided by the 4000 years old, satellite-lake Nabugabo in which 5 species evolved, that mainly differ in male colouration from their sister species in Lake Victoria. However, the vast amount of species that evolved in such short time span is insufficiently explained by allopatric speciation. Other mechanisms, like niche segregation and sexual selection were most likely involved as well. 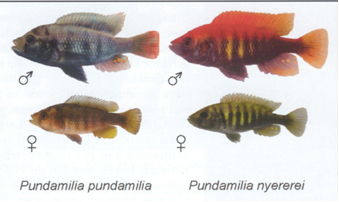 Disruptive sexual selection has been indicated as a mechanism for fast speciation in the cichlids of Lake Victoria. Subsequent niche segregation by rapid specialization for different feeding niches may have led to the spectacular adaptive radiation. The number of species, and of colour morphs within species, along rocky shores are related to the width of the transmission spectrum (Seehausen et al., 1997). This implies that more species (or colour morphs) coexist in clear water than in murky water. The brightness of the males also depends on the width of the transmission spectrum: the clearer the water, the righter the male colouration. This seems to be cased by sexual selection for male colours, i.e. females prefer the most conspicuous males (Maan & Verzijden, 2005; Maan et al., 2006). This, and the fact that sibling species with blue males on the one side and red males on the other often show much habitat overlap, led to the following speciation model. Different distributions of red and blue sensitive photoreceptors and slight variations of photopigments in females cause some of them to become more red sensitive and others more blue sensitive. Some variation in male hue also exists. If females prefer the most conspicuous males, the most blue sensitive females will choose the most bluish males, and so on. In this way, disruptive sexual selection may quickly drive the two groups apart. Subsequently, different microhabitat or food preferences may arise, for instance because of different visual capacities and by competition, resulting in adaptive radiation. The role of disruptive sexual selection is twofold: it can cause speciation in sympatry and it maintains reproductive isolation in sympatry between species that have evolved in sympatry or in allopatry. That male colouration and visibility play an important role in mate choice in the haplochromines of Lake Victoria has been proven. Laboratory experiments have demonstrated that in monochromatic light, females cannot discriminate between a conspecific male and a male of a sibling species with a different male colouration, while under broad illumination they prefer conspecific above heterospecific males (Seehausen & van Alphen, 1998). The importance of visibility for reproduction is also supported by the fact that in the deeper areas over mud, spawning mainly took place during periods with highest water transparency. In contrast, the relatively clear shallow sandy and rocky habitats, most haplochromines spawned year-round (Witte, et al., 2005). Apart from the fast development of reproductive barriers in allopatry and sympatry, there is more to explain why these fishes were so successful in adaptive radiation. In cichlids the upper and lower pharyngeal jaws are decoupled, and consequently the degrees of freedom are greater in comparison with generalized percoids. This decoupling is assumed to facilitate rapid specialization for different feeding niches. Anatomic differences between closely related species are often small and the adaptiveness of such differences must be demonstrated. One example is given by the food uptake in four rock dwelling species. Simple biomechanical models show that some species are better adapted to food uptake by biting and others by suction feeding: an improved biting force can be realized, among others, by a lower jaw that is relatively short; a better suction capacity is obtained by a stronger protrusion due to elongation of the premaxillary ascending arm (Barel, 1983). Performance studies in which food uptake rate was tested for algae and free swimming Chaoborus larvae revealed that the biter anatomy was indeed best for algae scraping and the sucker anatomy best for capturing prey from the water column (Bouton et al., 1998). Niche segregation has been studied in many co-existing species in the Mwanza Gulf that share the same food source (e.g. 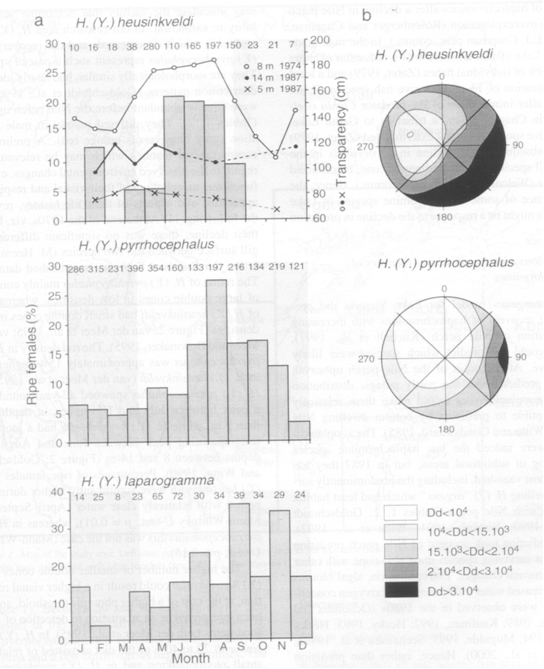 Hoogerhoud, et al., 1983; Witte, 1984; Goldschmidt et al., 1990; Goldschmidt & Witte, 1992). Two insectivores, H. iris and H. hiatus, that initially only could be identified by their male colouration, appeared to be segregated by depth. During the rainy season, the oxygen concentrations in the deeper water could drop considerably. The gills of the deeper living species (H. iris) appeared to be adapted to such low oxygen concentrations by having a much larger gill surface due to a higher number of filaments than was found in H. hiatus. At least ten zooplanktivorous species were present in a rather small part of the Mwanza Gulf. In general these species were segregated by bottom-type, distance from the shore and level in the water column. H. argens had a broad horizontal distribution in both the Mwanza Gulf and Emin Pasha Gulf, where it was mainly restricted to the top layer of the water column (0-2 m). H. megalops and H. piceatus occurred in the shallower regions (2-7 m) of the Mwanza Gulf. Trawl catches suggested that the latter species dwelled closer to the bottom, while H. megalops had its main distribution slightly below H. argens. H. pyrrhocephalus and H. heusinkveldi had their main distribution in slightly deeper water (8-14 m) in the centre of the Mwanza Gulf. Vertically they took an intermediate position between H. argens and H. reginus during the day, while they migrated towards the surface at night. H. reginus remained closer to the bottom and also occurred outside the Gulf near the Entrance. The deepest regions of the Mwanza Gulf are near the Entrance (15-22 m). 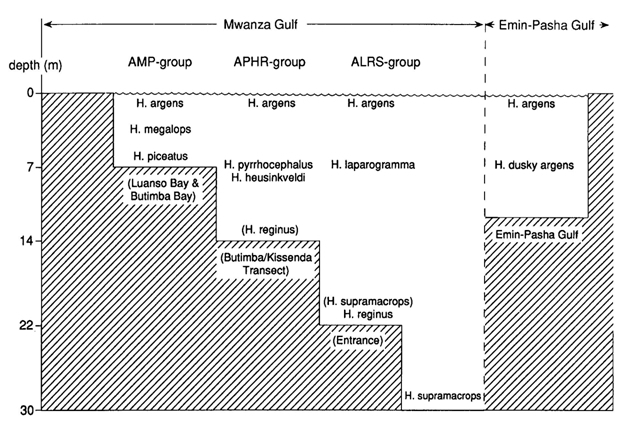 This was the principle area where H. laparogramma occurred at intermediate depths between H. argens and H. reginus. Another species from the Entrance of the Gulf, H. supramacrops, was probably a bottom dwelling species. About 150 km westward, H. dusky argens occurred below H. argens in the Emin Pasha Gulf, a habitat comparable to the shallow one in the Mwanza Gulf. Some species showed considerably overlapping distributions. Diurnal vertical migrations were common while the location of spawning sites suggested occasional horizontal migrations. H. pyrrhocepalus and H. heusinkveldi occupied virtually the same habitat. Nevertheless, they were segregated by different reproductive strategies, food preference and visual capacity. With a higher retinal resolution H. heusinkveldi could detect smaller food items and included phytoplankton in its diet which has never been found in the stomachs of H. pyrrhocephalus.